Online Cenotaph is a comprehensive online hub for stories of New Zealand service personnel, developed by Auckland Museum; Containing the records of approximately 150,000 men and women who served for New Zealand from the 19th Century through to today, Auckland Museum is requesting the help of communities throughout New Zealand to enhance these records further. He Pou Aroha Community Cenotaph provides portable digital access to Online Cenotaph using innovative purpose-built digitisation kiosks. The digitisation kiosks allow you to search Online Cenotaph, lay a virtual poppy against a specific person's name and contribute additional information to the database. 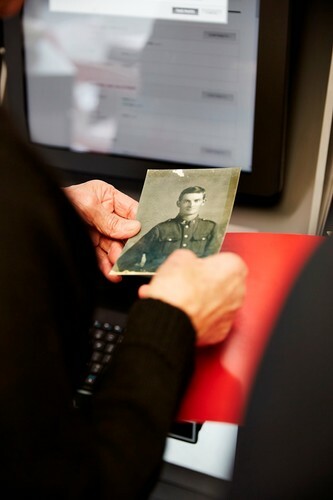 Each kiosk contains an object photo booth that enables you to digitise your family's war-related items such as medals, diaries, letters and more. The digitised objects are uploaded to the relevant service person's Online Cenotaph record for the world to see and future generations to remember. Auckland Museum's digitisation unit will be at Botany Library for members of the public to search Online Cenotaph, lay a poppy and contribute to the database. Drop in during opening hours to #DiscoverYourConnection.